Thank you for your interest in volunteering for Sail Boston 2017®. It promises to be a truly remarkable event! To apply to become a volunteer, please fill out the form below and we will do our best to accommodate your preferences. Contact us with any questions or if you would like more information. If yes, please specify in the Comments area below. Volunteers will provide information to Sailors and Crews, assisting them with various services, such as currency exchange, directions, medical information, and transportation assistance. This job is service oriented and requires volunteers with patience and a pleasant manner. Long hours will be required. The centers will also provide general information, internet, copying machines, computers for crew members. The Sail Boston® Liaison System is crucial to the success of Sail Boston 2017®. The program ensures that the Captain and crew of each vessel receive necessary assistance while they are in port. In addition, the liaisons are the contact persons to inform the vessel about Boston and the various cultural, entertainment and athletic events within the City. Should be available for daily early morning briefings. This job requires long hours and a great deal of flexibility. This opportunity incorporates all levels of proficiency in many languages; mostly Spanish, Russian, Portuguese, Danish, and French. 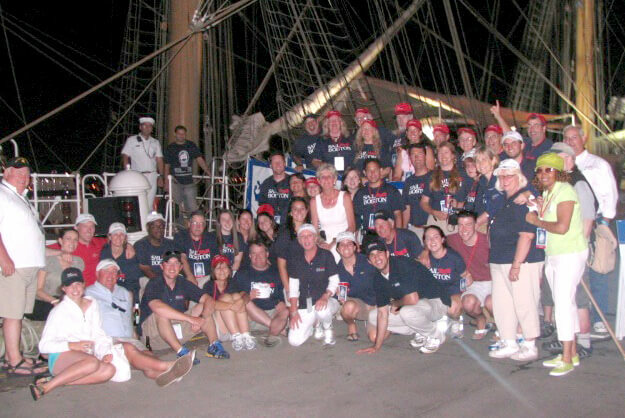 Volunteers will staff both the Main Liaison Centers and/or Deck tops of ships in order to aid in translating with the general public and ship crews. Information booths will be set up at all centers. Volunteers will be responsible for providing cadets, crew, and the general public with information and directions to Sail Boston 2017®. This job is seated and shaded. A pleasant and patient nature is necessary. This is the hospitality center for Sail Boston 2017® Sponsors. Volunteers provide general information and assist Sponsors. This is an “on your feet program”, and a service personality is necessary. This position entails various odd jobs to assist the Sail Boston® Team, including delivering items and messages to locations around the city. This is a wonderful opportunity for people to see the inside operations of a major special event. It also offers excellent experience and requires a great deal of energy. The festival assistant will work on events during Sail Boston®. These tasks will include set up, break down, and/or working a station. This is an excellent opportunity to see the organization of events.